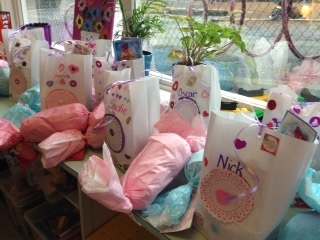 It’s been a pretty fabulous week in the Kindergarten as far as celebrations go. 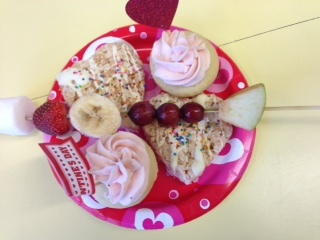 We just celebrated our fifth birthday in Division 16 this month, complete with delicious, sugary treats, and both classes are in the midst of distributing sweet Valentines to our classmates. At the same time we’re getting ready to celebrate Chinese New Year next week with some special centres and a small banquet luncheon. 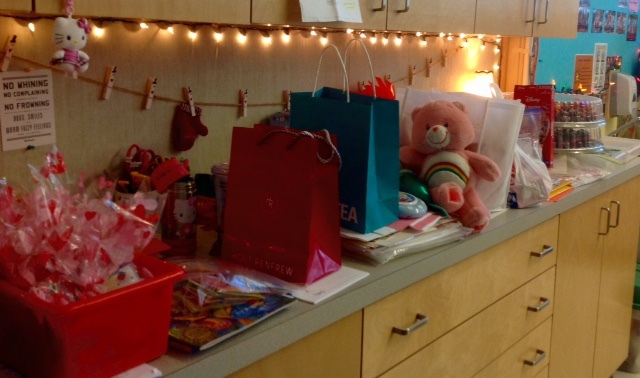 We’re decorating our classroom to reflect our festive mood and there’s lots of bright colour and streamers everywhere. You’d think with everything going on that we’d be feeling the energy that goes along with the excitement of Special Days and rich eating. But we were noticing that despite all the interruptions (wait till you hear about next week) and changes in schedule, our children return to their self-regulation foundations, the strategies they know will help them to stay calm despite what’s happening around them. Christy and I realize that we see the benefits of teaching self-regulation strategies regularly during times of great excitement and change in the classroom routines. The Hallowe’en Parade and Assembly and Christmas Concert were two major fall school events where we see how well we’ve taught the lessons. Can our children manage their energy effectively and efficiently? Are they able to recognize when they have up-regulated to the yellow zone from the green zone, and can they down-regulate as quickly as their emotions have risen? Yes, we know that they can. We know that our structured approach to teaching calming strategies and scheduling time for meditation since the the early days of Kindergarten pays off as the school year progresses. So here we are, another six weeks later, and today, as the children were settling down after recess, the calm and contentment in the classroom as we listened to quiet music (George Winston’s “Reflection” from the Winter into Spring album) was like a lightweight, but cosy blanket you just want to wrap yourself in. What a delightful time to be a Kindergarten teacher, to watch and enjoy the growth and maturity in each child, all of them blessed with so much wonderful promise and potential. We are privileged to be in the best profession, and certainly fortunate to be teaching such a glorious age group. A very jolly time we are having, indeed. 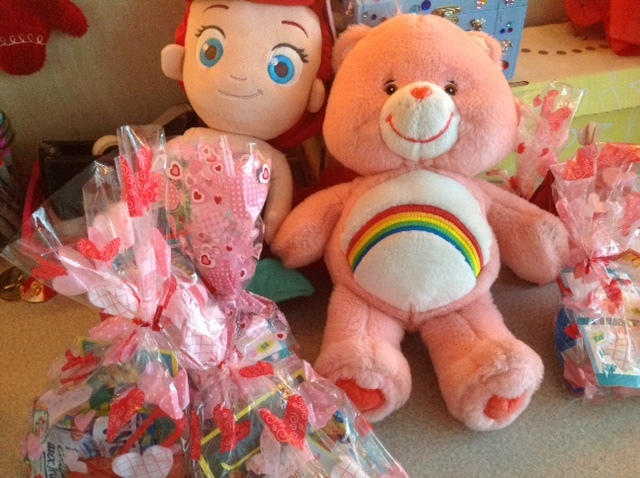 Valentine excitement was everywhere, from dressing up in pink, white, red and purple, to tucking in the final Valentine cards to our special card holders to eating some festive goodies. 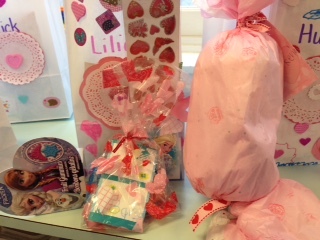 Thank you to all the parents for sending in such wonderful February treats! We met with our Grade 7 Buddies again this week to work on the next page of “what penguins eat” for our penguin inquiry and digital literacy projects. We finished working on the letter Q in the alphabet. On Monday, we’ll be watching a special Duffle Bag Theatre production of “Snow White” during a school assembly. Monday is Library Book Exchange for Division 15. On Tuesday, both classes will be having Chinese New Year celebrations in their classrooms. We’ll be playing special centres and sampling some special Chinese delicacies. Please remember to wear red, a special good luck colour in Chinese culture. Tuesday is Library Book Exchange for Division 16. Thursday is our second and final skate day. Please remember to send skating pants, gloves and bring your helmets and skates if you have them. Your classroom teacher and parent helpers will assist with the skate and helmet rentals. Friday is the popcorn sale and the Kindergarten will participate. $1 per bag. The Kindergarten children will only purchase one bag each so please send in only $1.